Cedrick Desjardins doesn't easily lose focus, whether in practice, a game or in achieving his goals. A late pick by the QMJHL’s Rimouski Oceanic in 2002 (13th round, 200th overall) and passed over by NHL teams on draft day, Desjardins is used to walking against the wind en route to establishing his hockey career. It may not be a traditional path he’s following, but that hasn’t stopped from racking up experience and success. A successful 2004-05 campaign with Rimouski saw the club reel off a league-record 35 straight wins (28 regular season, seven playoff), before he and his Oceanic teammates – which included a young chap by the name of Sidney Crosby – fell to the London Knights in four straight games in the Memorial Cup Final. Traded to Quebec during the offseason, Desjardins then found himself under the direction of Patrick Roy. That season, he and his Remparts teammates shocked the Moncton Wildcats to claim junior hockey’s top prize, with the St. Pascal native named as the tournament’s best goaltender. 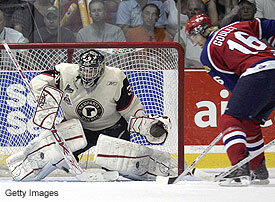 Desjardins was a key factor in the Quebec Remparts' 2006 Memorial Cup Championship. The success wouldn’t stop there. With his junior days done, Desjardins took the next step, inking an AHL pact with the Bulldogs. Given the lineup towards the Canadiens’ crease, Desjardins spent two seasons plying his trade with the Cincinnati Cyclones of the ECHL. Last year, he helped lead the Cyclones to the top of the league’s standings before capping off their stellar season with a Kelly Cup Championship. Desjardins followed up a 1.92 goals-against average and .934 save percentage in the regular season with equally impressive numbers (1.84 GAA,.939 save percentage) in the postseason, to earn playoff MVP honors. He may have two championships under his belt in three years, but that’s only fueled the hunger and the drive that much more. “You only get used to it once you win and when you do, you want it even more,” admitted Desjardins. “You have to be lucky but you also have to create your own luck. The desire to win likely comes as little surprise given the guy holding the reins of his first championship. A standard butterfly goalie, Desjardins, like most Quebec native netminders, admired Roy growing up and learned a lot under his tutelage. Clearly, the guidance offered by the Hall of Famer has served him well. 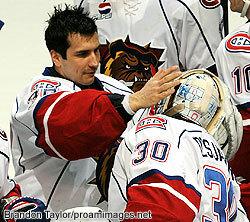 Roland Melanson has been working with the young netminder for a few years now. He’s helped him perfect his technique and other physical aspects of his game, but the competitive drive has been all Desjardins. Veteran Marc Denis has been a great influence on Desjardins in Hamilton. While he graduated to Hamilton at the start of the campaign, the acquisition of Marc Denis forced the 23-year-old into a backup role. Accustomed to the lengthier routes over the course of his young career, Desjardins has fared well thanks to his intense focus and hard work. And, having a veteran like Denis to guide the rookie netminder has helped push him even more. “He’s such a great, funny guy with experience and a lot of passion,” said Desjardins. “Marc’s a really good guy to follow; he’s got a good work ethic and is a real leader. And no matter what battles he faces on the way, there’s no question he’ll be competing every step of the way. But, he also knows that just one key to eventual success.